Cera Alba. 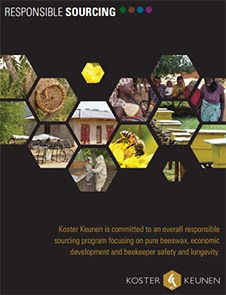 100% Certified Organic Beeswax #436 by Koster Keunen acts as a moisturizer, wax & consistency factor, emulsifier and antiseptic. Also acts as a plasticizer, barrier, film former, emollient and gelling agent. It is GMO-free. It has a soft pliable nature and free of modern agricultural techniques, herbicides and chemical treatment with fertilizers and pesticides. The natural beeswax chemistry remains intact and it is 100% organic. 100% Certified Organic Beeswax #436 finds application in formulating creams, lotions, cold creams, depilatories and sunscreen products.